Andy Peaks admitted there was a sense of disappointment around the AFC Rushden & Diamonds dressing-room after they had to settle for a 1-1 draw against Banbury United at Hayden Road. A competitive clash saw Diamonds take the lead 12 minutes into the second half through Ben Diamond. 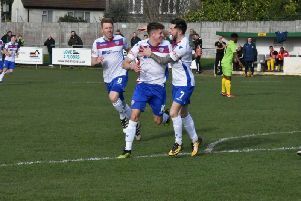 But Banbury grabbed a deserved equaliser thanks to former Corby Town frontman Steve Diggin as both sides picked up a point to remain in the hunt for the play-off places in the Evo-Stik League South Premier Division Central. And while Diamonds boss Peaks conceded the final outcome was a “fair result”, he was slightly disappointed after his team had held the advantage. “I think you’re always disappointed when you’re 1-0 up with 15 minutes to go and you don’t win,” he said. “They didn’t really create many chances in the second half, I thought we looked comfortable and we looked a threat when we did go forward. “The dressing-room was a bit disappointed because it felt like two points dropped. However, overall it was probably a fair result. “I said before the game that I wanted to see how far we had come because we were poor when they beat us over there. “Looking at the bigger picture, we have shown again that we can compete with a strong side. “Performance-wise, I was quite happy and we were bit unlucky to hit the bar and we had a couple of chances after we’d scored and a second goal would have killed it. Peaks, meanwhile, believes the response his team have given over the last few weeks has been “typical”. Diamonds started the new year with the bitter disappointment of a last-gasp defeat to local rivals Kettering Town. But they have gone four matches without a defeat since then. And Peaks added: “We have gone on another good run, we have lost two in 15. “It was disappointing after the game at Kettering but the reaction has been typical of the character I have in the team and I didn’t expect anything different.